Grill chicken legs evenly, crispy and delicious: With the Grill Republic chicken rack, arduously turning chicken legs is a thing of the past. Simply hang the chicken legs in the chicken frame and place in the oven or on the BBQ. All legs are cooked evenly on all sides until crispy and brown. The juices simply drip off without causing any smoke and can be used as a sauce. High quality & saves space: Our BBQ rack is made of high-grade stainless steel and is very sturdy and durable. Thanks to its special construction, it saves a lot of space: simply collapse the top frame and place it in the base to optimally store everything. A great gift and must have for every barbecue fan: Thanks to its elegant packaging and modern design, this rack makes a perfect gift for every BBQ enthusiast. The BBQ rack is an eye-catcher at every barbecue party and will ensure a special grilling experience. 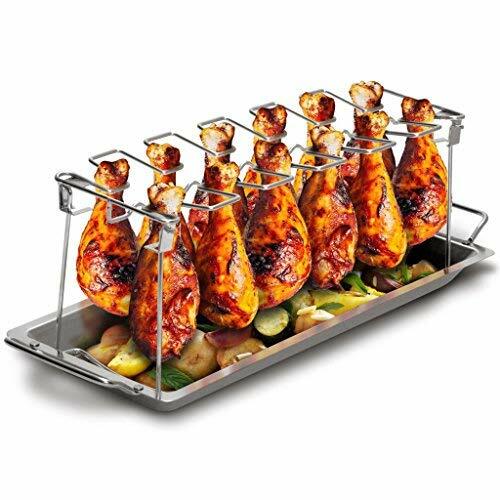 Oven and dishwasher-safe: Thanks to the high-quality stainless steel, the chicken rack can be used in the oven and is also dishwasher-safe - the best conditions for easy enjoyment.